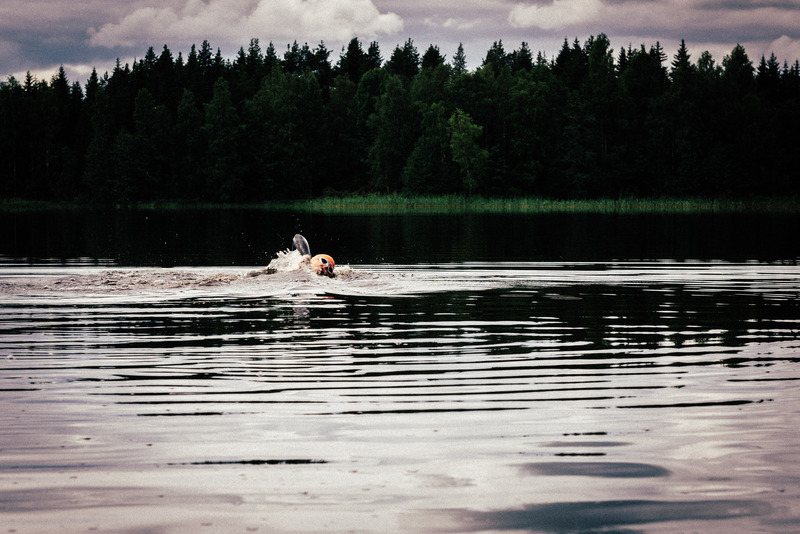 Open water swimming is probably the topic causing most worries for beginning triathletes. I remember belonging to that group a coulple years back after learning to swim freestyle in a pool over the winter and awaiting for the open water season to begin. I was reading stories of all sorts of swim problems on triathlon forums ranging from getting kicked in the face during the start, being swum over and pushed underwater, all the way to all out panicking and inhaling water. In the pool, I tried to get myself ready for open water by swimming with my eyes closed when facing the water, practicing sighting (looking where I was going above the water instead of underwater) and trying to pick the busy lanes where I needed to get used to the people swimming around me. Eventually, I picked a nice sunny evening at a familiar lake and gave it a try. After spending countless hours staring at the tiles in the bottom of the pool I quickly found swimming in open water quite liberating and fun! Even though there wasn´t much to see underwater, the things above the surface more than made up for it. And the best thing was you didn´t need to turn back every 25 or 50 meters – you could just keep going! I still find myself a bit nervous before bigger mass swim starts but I´ve found ways that help making even the most crowded triathlon swims as enjoyable as possible. 1. Practice enough open water swimming before the actual race. Take most of your swim workouts to open water as soon as the water temperature permits. At +16c the swimming is already pretty enjoyable with a proper wetsuit. If you still feel too cold add a pair of neoprene socks and a hat. 2. Practice in every weather. Obviously, swimming is most enjoyable when the weather is warm, sunny and relatively calm. 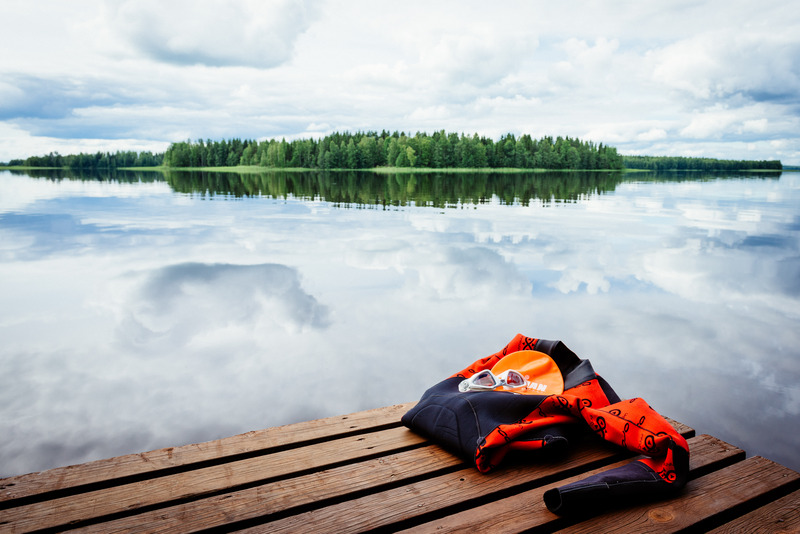 Try to get yourself out to open water also when it´s raining, windy and cold. You never know what the weather´s like at the race and you don´t want to do your first storm swim in a race. 3. Learn a comfortable way for sighting. 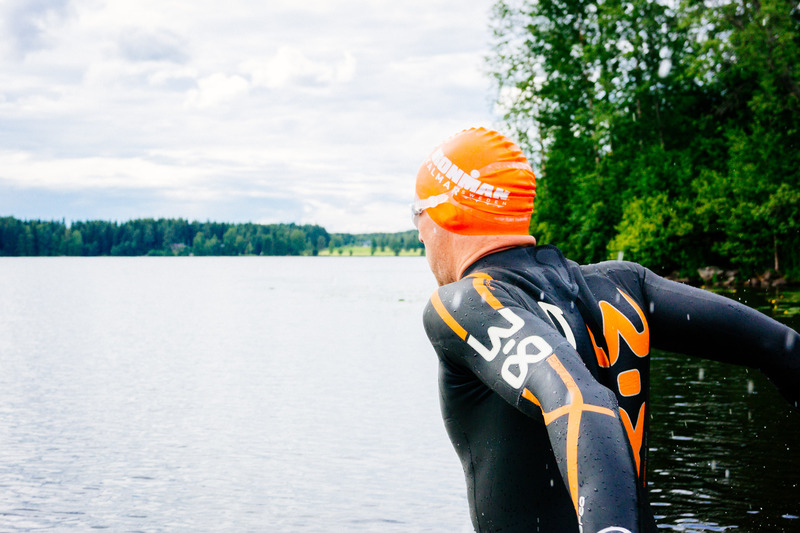 Knowing where you are and where you´re going not only helps you finish the swim faster but also adds up to the overall positive swim experience. I learned my sighting technique from YouTube and started training it already in the pool regardless of the funny looks from the other swimmers. Ít´s still not perfect but gets the job done! 4. Practice swimming with other people. Bring some friends and swim as close together as possible. Also try simulating the “mass swim start” by running to the water close to each other and sprinting for 100ish meters. You can actually benefit quite a lot from following close behind another swimmer but make sure the person you´re following knows where he/she is going to avoid detours. 5. Get proper open water swim goggles. Typical goggles made for pool swimming narrow your field of vision making it difficult to navigate and follow what´s happening around you. Triathlon swim starts usually occur early in the morning so consider clear lenses instead of darkened ones. Personally, I use the Kayenne Aqua Sphere goggles for both pool and open water swims. 6. Race with relatively new goggles. The swim goggles regardless of the brand tend to start fogging over time. Try to race in relatively new goggles to avoid fogging but make sure you´re not trying a new pair for the first time in a race. 7. Start your race swim in the “outer” end of the pack in relation to the first turn. Typically most of the swim hassle happens during the start and at the first turn. Try to position yourself to the far side of the pack allowing you to move away from the pack if you need some space for yourself. Starting from the outer side in relation to the first turn also provides you the possibility for taking the turn a bit long avoiding the masses trying to make their swim as short as possible. Sure, you´ll lose some time due to the extra length but that´s a small price to pay for the peace of mind. 8. Start out with small races. It´s always tempting to pick one of the famous races to be your first one but it definitely helps to get a couple of smaller training races under our belt before the real thing. Fewer swimmers means less hassle and more confidence. 9. Try a noseclip or earplugs. With well-fitting nose clip and earplugs you can prevent water getting to your nose and ears during the swim. Personally, I´ve found a nose clip very helpful especially when swimming in salt water and on windy weather when the water keeps splashing to your face. Make sure you practice with one if you´re planning to use it in a race. 10. It´s not all about the race. In the end, we spend way more time training than racing so it´s worth making that time enjoyable! Try to find locations where you find yourself enjoying the swims and remember to take the time for floating on the surface quietly soaking in the scenery around you! In the end, it´s well worth it! When you find yourself floating in the middle of a calm forest lake on early summer morning you´ll thank yourself for giving it a serious try! And go swim another kilometer or two! It’s in point of fact a great and helpful piece of information. I’m happy that you just shared this useful info with us.